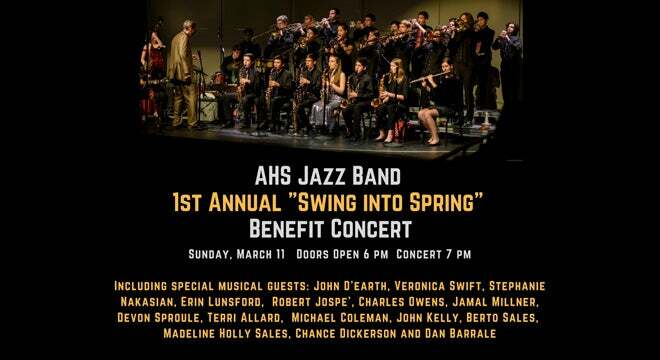 The nationally-acclaimed Albemarle High School (AHS) Jazz Band is gearing up for its first annual “Swing into Spring” benefit concert! The event will feature the band performing a set list full of jazz standards and pop/R&B hits that span decades and are bound to get people on their feet. And as a special treat for local music lovers, the evening will feature an all-star cast of the area’s top musicians sitting in with the ensemble including John D’earth, Veronica Swift, Stephanie Nakasian, Erin Lunsford, Robert Jospé, Jamal Millner, Charles Owens, Devon Sproule, Terri Allard, Michael Coleman, John Kelly, Madeline Holly Sales, Berto Sales, Chance Dickerson, Dan Barrale and more! The award-winning AHS Jazz Band, under the direction of Greg Thomas, has for decades earned high profile regional and national recognition for its consistent dedication to excellence and for its unwavering respect and love for this most uniquely American art form. The group, which recently took honors at the prestigious Essentially Ellington regional competition in Arlington, is raising funds to travel to Savannah, Georgia, where it is one of only 12 high school jazz bands from across America chosen to participate in the prestigious Swing Central Jazz competition at the Savannah Music Festival in April. The event will include two days of clinics with some of the leading jazz musicians and instructors in the United States, including members of the Jazz at Lincoln Center Jazz Orchestra, and will finish with a juried competition. As an added bonus for the community, event organizers have invited a host of the area’s most popular musicians to sit in with the band for a song. “We live in such an extraordinary musical community,” Thomas said. “And we thought it would be really fun for our kids and for the audience if some of them joined us on stage. We’ve been overwhelmed with the positive response we’ve received from musicians.” Thomas and musician/WHTJ PBS show host, Terri Allard, will emcee the event. Donations may also be made on the Jefferson Theater event ticketing page.